Tamper-evident food packaging is taking on a higher profile as processors, retailers and consumers fret about the possibility of bioterrorism and other threats to the food supply. The costly problem of product damage caused by consumers opening packages to sample products also is fueling interest in tamper evidence. Ames Int'l. uses some nontraditional tamper-proofing methods in its high-end gift candies. The acrylic jar is tamper-proofed by using a plastic "zip tie" that is looped through the clasp then hidden by a bow. Shrink bands and tamper-evident seals and tapes continue to play an important role for packages ranging from single-serving containers to shipping cases. And in the future, radio frequency identification tags and light-emitting polymer technologies may step in next to these familiar devices. The focus on tamper evidence is well founded. Malicious tampering can be incredibly expensive for the victimized company. In the early 1980s, Johnson and Johnson took a $100 million charge against earnings after voluntarily recalling its Tylenol products. Driving the recall was a tampering incident that left seven people dead from ingestion of cyanide-laced Tylenol capsules. More recently, in Australia this summer, Masterfoods lost an estimated US $7.5 million when an extortionist claimed to have contaminated Mars and Snickers bars with pesticide. Masterfoods removed the chocolate bars from 40,000 stores in the Australian state of New South Wales. "There's always that fear" about malicious tampering, says Amy Paulose, director of marketing at Ames International Inc. (www.emilyschocolates.com), a Tacoma, Wash.-based company that sells chocolates and nuts. "The worst thing someone could do is put some kind of poison into food. There's also the question of how we keep people from stealing the product" from inside the package. Ames uses many types of packaging, including conventional polyethylene terephthalate (PET) and acrylic jars as well as novelty packages such as Chinese take-out food boxes and cloth dolls. The company uses a variety of tamper-evident techniques to accommodate the breadth of containers. For canisters and jars, Ames applies an induction seal across the mouth of the container. For boxes of chocolates, shrink wrap provides evidence if the packaged is opened. Protecting seasonal, gift and novelty packaging requires more creativity, both because the container shapes are unusual and because the items are produced in small batches. Product volumes don't support an investment in automated tamper-evident packaging equipment. For Ames' gift jars of chocolate-covered fruits and nuts, a plastic zip tie is manually looped through the clasp of the jar's lid and concealed with a bow. The zip tie locks the lid; opening the jar requires cutting the zip tie. The company thwarts tampering with its snowman-doll package by borrowing technology from the garment industry. A pouch of chocolate-covered nuts resides in the body of the doll, and the head pops off. The company locks the head onto the body using the same kind of plastic loop used to attach price tags to clothing. For high-volume products such as beverages and processed grocery items, shrink labels and bands remain a favorite tamper-evident tactic for unit-level packaging. The bands typically are made of shrinkable polyvinyl chloride (PVC), glycolized polyester (PETG) or oriented polystyrene (OPS). A transparent tamper-evident band, which is part of the full-body shrink label, wraps over the lips of the twin shake and pour spouts on the lid of General Mills' Betty Crocker Decorating Decors package. Photo courtesy of Seal-It Inc.
"Tamper evidence has become bigger and bigger," says Sharon Lobel, president and CEO of Seal-It Inc. (www.sealitinc.com), a Farmingdale, N.Y., maker of heat shrink labels and films. "If you were to walk into a supermarket years ago, there might have been a few items that had a tamper-evident band, mostly vitamins. Now most of your food items have a tamper-evident band. And the bands are more elaborate as time goes on, especially in food." General Mills Inc. (www.generalmills.com), Minneapolis, uses a full-body shrink label for its Betty Crocker Decorating Decors packaging. The label incorporates a transparent tamper-evident band that wraps over the lip of the twin shake and pour spouts on the lid. Seal-It supplies the Decors labels. More processors are striving for tamper-evident bands that coordinate with or even merge with the label's graphics. Stallone's Italian Kitchen (www.stallones.com), Deerfield Beach, Fla., took this approach for its salad dressing packaging. Stallone's uses brightly printed, full-body shrink labels on glass bottles. Supplied by Seal-It, the PVC labels are rotogravure printed in 10 colors. The label incorporates a tamper-evident seal with a horizontal perforation. When the perforation is broken, the seal is removed and the label remains on the bottle. Shrink bands are finding their way into applications far beyond bottles and jars, as well. With more produce marketers entering the fresh-cut segment, tamper-evident bands are becoming commonplace on thermoformed trays of salad mix and pre-cut vegetables and fruit. The band provides consumers with "an additional comfort factor," says Ed Farley, sales manager with Axon Corp. (www.axoncorp.com), a Raleigh, N.C.-based company that sells tamper-evident banding systems. Pressure-sensitive seals are another option. This fall, Radlo Foods LLC (www.radlo.com), Watertown, Mass., introduced a new egg carton that incorporates a tamper-evident seal. Born Free fresh eggs have a clear PET tray that protects the eggs without hiding them. In contrast to conventional pulp cartons, the plastic trays let consumers check the eggs' integrity without opening the package. This package is only one part of the company's focus on safeguarding Born Free eggs. Radlo uses a laser tool to etch permanent freshness and traceability codes on the shell of each egg. The codes make it possible to trace the eggs back to their source. Tamper-evident features on individual packages protect against meddling at retail. But to protect against tampering during distribution, processors need to incorporate security features at the case and/or pallet level. This applies to the processor's suppliers, as well. It's not uncommon for food processors to refuse delivery of ingredients into their plants if the bulk packaging lacks anti-tampering features. The U.S. Dept. 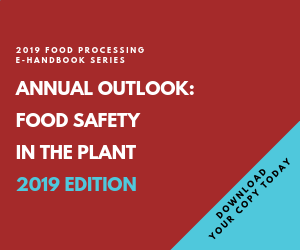 of Agriculture Food Safety and Inspection Service (FSIS) booklet "FSIS Security Guidelines for Food Processors" provides the following guidance on the topic: "All outgoing shipments should be sealed with tamper-proof, numbered seals that are included on the shipping documents. Establishments should require that incoming shipments be sealed with tamper-proof, numbered seals, and that the seal numbers be shown on the shipping documents for verification prior to entry to the plant." 3M-Matic X-Tape 2000 Stretchable Tape provides comparable load stability vs. stretch film and netting, while allowing for airflow (to prolong produce shelf life, for example) and avoiding damage to packaging that can be caused by sweating inside plastic film wrap. The booklet also advises, "Packaging integrity of all incoming shipments should be examined at the receiving dock for evidence of tampering." To achieve visual tamper evidence on shipping cases, the approach can be as simple as securing a strip of water-activated tape across the case's top and bottom opening. Water-activated tape bonds with the paperboard fibers of the corrugated board. When the tape is pulled away, the case shows visible signs of damage. "The glue becomes part of the carton. Within seconds, the tape and the carton bond as one piece. It dries, and if you try to take off the water-activated tape, you'll have evidence someone tried to get into the case," says Bob Collins, product manager with Better Packages Inc. (www.betterpackages.com) Shelton, Conn.
Case- and pallet-level security is important not only to processors, ingredient suppliers and retail customers but also to foodservice customers. Of those, one of the largest is the U.S. military. "Currently we're looking at various concepts in pallet wraps — shrink and stretch wrap — that would show evidence of a breach of that pallet," says Chief Warrant Officer Stephen Moody, team leader, Advanced Processes and Packaging Team, Natick Soldier Center (www.natick.army.mil/soldier), Combat Feeding Directorate, Natick, Mass. Further, as part of its ongoing research into tamper evidence, Natick conducted a field test of self-adhesive labels on shipping cases. Labels were placed across the openings of the cases. When peeled off, the labels left an image or phrase indicating the cases had been opened. Unlike commercial food packages, which any number of retail employees and consumers may touch before the item is consumed, the military's Meals, Ready-to-Eat (MREs) usually stay in the case until the time of consumption. Therefore, tamper-evident features are essential for cases. "We're making sure that case gets to its final destination intact. Typically, once the case is opened, it's issued to soldiers," Moody explains. For the field test, Natick used tamper-evident labels, including some with holographic images, supplied by Avery Dennison Corp. (www.averydennison.com), Westlake Village, Calif., and by 3M (www.3m.com), St. Paul, Minn. Eventually, as costs come down, the tamper-evident technologies currently used on packaging for pharmaceuticals and other high-ticket items may eventually be used on food packaging. These tactics include covert techniques such as invisible inks, nanoprinting, and microscopic, traceable taggants. All covert tactics require specialized reading devices to reveal the marked package's integrity — or lack thereof. "A covert tamper-evident device can't been seen without the use of special equipment. The consumer is not aware of it. But the company can view the device using an appropriate instrument and determine whether someone has tampered with the product," says Melvin Pascall, assistant professor in the Dept. of Food Science and Technology at Ohio State University (www.osu.edu), Columbus, Ohio. A polyethylene film under development at Case Western Reserve University changes its fluorescence color from orange to green when ripped. The color change is invisible to the naked eye. He adds, "If it's a case in which the company is concerned about employee tampering, only a few of its top managers may be aware of the presence of the covert tamper-evident device." A technology that could, in the near future, be used for covert tamper evidence is in development at Case Western Reserve University (www.case.edu), Cleveland. Researchers are formulating polymers (see photo, right) that incorporate a small amount of fluorescent dye. When the polymers are mechanically stressed by tearing, pin-holing or deformation, the dye dramatically changes color. The plastic may change from red to green, for example, or from yellow to blue. The color change is not perceptible to the naked eye; an ultraviolet-light instrument is required for detection. The technology could be used to create films, tapes and/or labels that change colors when the package is tampered with. "We're just a step away from commercialization of this technology in the form of tamper-evident tape and other products," says Christoph Weder, associate professor of macromolecular science and engineering at the Case School of Engineering. Led by Weder, the research team includes graduate engineering students Brent Crenshaw and Jill Kunzelman. Because the polymers and some of the dyes used in this research are commercially available already, the technology should prove cost-effective when it makes the leap from the lab to commercial applications. And because the dyes are added at a very low level, the plastic's physical properties remain unchanged. "The dye molecules are added at the level of 0.2 percent. That's similar to the level for polymer additives such as antioxidants and ultraviolet stabilizers. The addition of the dye does not change the polymer's characteristics," Weder says. Although the compatible dye molecules vary by polymer, the concept is compatible with a range of plastics used for rigid and flexible food packaging. These include polypropylene, polyethylene and polyester. To be sure, bioterrorists, extortionists and even benign sneak-a-taste consumers are a tricky lot. But they've met their match in the researchers and packaging professionals who continue to develop new tamper-evident technologies and find creative applications for existing ones. Radio frequency identification (RFID), most commonly used today to manage the supply chain, also has the potential to flag tampering. RFID-tagged cases and pallets can be rigorously tracked, and if a tagged object for some reason becomes unreadable, the failure may point to tampering. "Say the monitoring system is continually probing to hear from 100 tags, and all of a sudden it only hears from 99," says Mike Sheriff, president of AirGate Technologies Inc. (www.airgatetech.com), Allen, Texas. Clearly, "Something happened." As prices for RFID tags become more affordable, the technology could even be used for tamper evidence at the item level. One scenario would be to mount an RFID tag over the lid of a jar in such a position that unscrewing the lid would break the connection between the tag's chip and its antenna. That connection is essential for proper tag function. When RFID tags eventually find a place in mass-market, tamper-evident packaging, they likely will be combined with bar codes and other technologies that combat tampering, counterfeiting and theft. "We expect multiple technologies will be nested together to provide the level of sophisticated detection the food supply chain will expect," says John Thorn, general manager of the RFID Group of Checkpoint Systems Inc. (www.checkpt.com), Thorofare, N.J.